In lieu of Wes Anderson’s upcoming film, Isle of Dogs, we thought we should take a moment and acknowledge the mustard yellow elephant in the hotel lobby: Architects have a thing for Wes. From Day 01 in design school, it’s almost a rite of passage to be made aware of his work, a snide “Oh you don’t know Wes Anderson?” followed by an eye roll. And if one of your professors isn’t an extroverted fan of his, you’ve probably stumbled into an engineering school. You see, film and architecture are the proverbial cousins of expression. Film is space-making. You’re watching a two-dimensional screen, and are immediately led to believe it exists, turning its corners and opening its doors. In a sense, film can’t exist without architecture (Don’t even get me started about Blade Runner). And architects? Well, you catch any one of us describing our designs, and you’ll hear us talking about our vignettes like they’re balancing the third act, rendering a coffee shop with a 20-something couple in mid conversation. And then you’ll roll your eyes. And Wes Anderson? He’s the officiate that ordained their marriage. He doesn’t just write/direct movies. He crafts space. Many talented directors have a vision for how they want their shots to feel, using architecture as a tool (think Kubrik’s technical 2001: A Space Odyssey, Hitchcock’s staged Rear Window, or even George Miller’s post-apocalyptic Mad Max: Fury Road). But none have such a critical emphasis to drive story, showcase character, define time, reflect psychology, and expose set, in such masterful detail. Virtually all of Anderson’s films revolve around a single highly meticulous location. 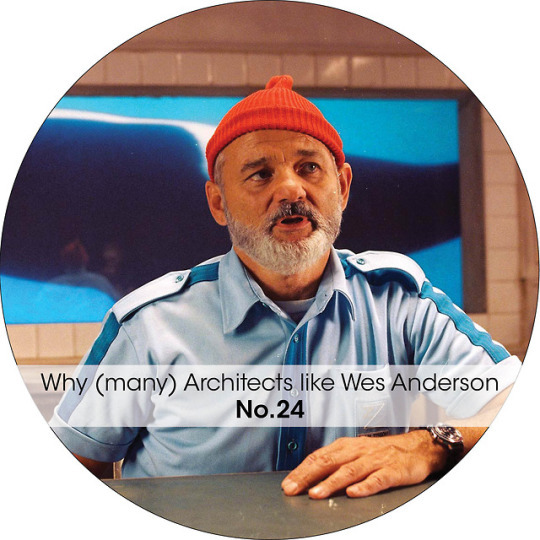 Whether a family home (The Royal Tenenbaums, Fantastic Mr. Fox, Moonrise Kingdom), a school (Rushmore), a mode of transportation (the ship in The Life Aquatic with Steve Zissou, a train in The Darjeeling Limited), or even the architecture itself as the namesake character (The Grand Budapest Hotel), Anderson takes great pain and care to put design in the forefront. Isle of Dogs (read that fast and you’ll smile) will be on an Island of dogs. And you can bet he designed every inch of that island. And that’s awesome. In The Royal Tenenbaums, still shots of the family’s rooms give us more personality traits than any cheap dialogue could. In The Life Aquatic, Bill Murrays “Let me tell you about my boat…” leads to a full 1-1 scale cutaway and uninterrupted panning shot of the Belafonte’s innards, complete with scale figures and two albino dolphins. And The Grand Budapest Hotel portrayed a scale model to make our basswood hungry fingers drool. And it wasn’t just the Hotel that could give Anderson an honorary AIA; everything was custom-designed: from flags, banknotes, uniforms, right down to pastry boxes, perfume bottles, and stamps. It’s honestly quite draining to think of the work put in. Apart from the architecture, what designers also gravitate to is his whimsical touch of style, from the now infamous color palette, to his heavy use of the font Futura. You will spend an hour and a half mesmerized by the ticking of gears, or indulge in what I would consider a moving painting. Through his cinematography, he moves through filmic space as if it truly existed, utilizing his signature long tracking shots and zooms to show you a choreographed piece not cheated by clever editing, similar to an architect’s BIM Model walk-through. And as many of his films require a specific adventure, there are plenty of maps, plans, elevations, sections, and diagrams to get us all excited. With so much unique character, it’s no wonder that r/AccidentalWesAnderson is a trending subreddit and Instagram page of user photos of real places reminiscent of the filmmaker’s sets and style. Not to mention someone made a montage video of “The Perfect Symmetry of Wes Anderson’s Movies” to highlight his consistent and provocative use of symmetrical shots, a young designer’s first introduction to aesthetic. Learning what you’ve learned today, I hope you have a better appreciation for his work, and make some time to see Isle of Dogs coming out this week. It’s sure to include many, if not all, of his techniques. So you can spot them, lean over to your friend with a smirk and say, “that’s classic Wes.” Plus, it’s an island full of talking dogs. That’s just cute.